Let's Scrap "Leap Around the World" Blog Hop. If you are coming from Susanna Granroth's blog, "Lilla My's andrum", then you are on the right track. If you didn't, you may want to start your leap at the first stop on this hop at Mindi Brown's blog, "Scrap Chat & Coffee Talk". Also, if you get lost along the way (i.e., broken links, etc. ), you can go to Mindi's blog for a list of all the participants. There are 50...yes, 50!...talented crafters from around the world ready to share with you a different card sketch and their interpretation to help motivate and inspire you to make your own creations. Base is colonial white cardstock cut to 5 1/2" x 8 1/2" and scored to create a standard A2 (4 1/4" x 5 1/2") card. Sewing-pattern paper was cut to 4 1/8" x 5 3/8" and the edges were sponged with Cocoa ink. Floral (teal-colored) pattern paper was cut to 2 1/2" x 5 3/8" and the edges were also sponged in Cocoa ink. Damask (red-colored) pattern paper was cut to 2 1/2" x 3" and edges were sponged with Cocoa ink. 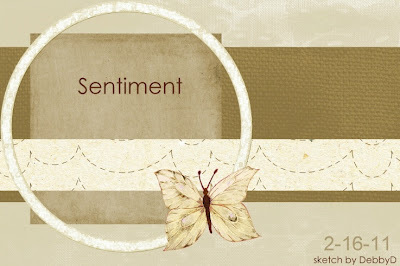 Sentiment is stamped with Cocoa ink. Circle chipboard was traced onto multi-colored pattern paper. Circle was trimmed and adhered with glue pen to chipboard. Edges were sanded with finishing files and inked with Cocoa ink and adhered to card with mini glue dots. Stamped two flowers (outline) in Cocoa ink on Colonial White cardstock. All of the interior petals of one flower were created by inking with Sunset ink and stamping off one time on scrap paper before rolling 2/3 of the stamp in Sunset ink and then the inside corner in Tulip ink. Sponged edges with Cocoa ink. Step 9 was repeated on 3 of the 6 petals of the second flower, trimmed, sponged edges with Cocoa ink and adhered to every other petal of the first flower with foam tape. Used a piercing tool to pierce a hole in center of flower and added a copper brad. Stamped two leaves on Colonial White cardstock, trimmed and inked edges with Cocoa ink. Adhered flower to card with foam tape and leaves with glue dots. Added Mocha Opaque gems to card (using the piercing tool to help with placement). If creating for the sake of creating isn't enough reason to play along, then how about chances to win some crafting goodies? Every blog is offering a little "candy". Close To My Heart's new Stitching Ruler! How do you enter a chance to win it? Super simple. Be (or become) a member of Let's Scrap, which you can do by clicking here. It's really simple to do and you'll be glad you did. Leave a comment with a link to your card on Let's Scrap. Now, you may be thinking...."Wow...I'd love to enter for them all, but 50 is a lot of blogs to get to". Well, you're right about one thing...50 is a lot, but the good news? You have all month to play along! The hop ends on Wednesday, February 29th at 11:59 CST (track the time by using the clock on the main page of Let's Scrap). I hope you enjoyed your visit with me and I hope you come back to visit sometime. Enjoy the rest of the hop. The next blog on this journey Diana Taylor's blog, "Moshie's Moments" and check out her creation. 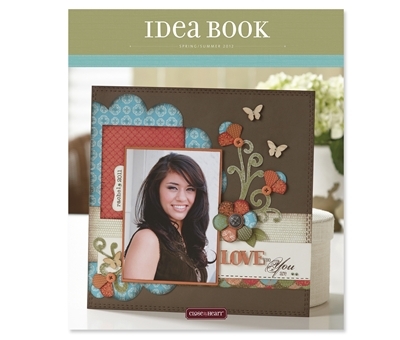 The new Close To My Heart Spring/Summer 2012 Idea Book has just been released (Feb. 1). If you would like a free copy...just click on the Paypal link below. Shipping is $5, but you will receive a coupon for $5 off your first purchase of $25 or more. Amazing card Tamytha. Love what you did with the circle chipboard and chocolate striped ribbon. 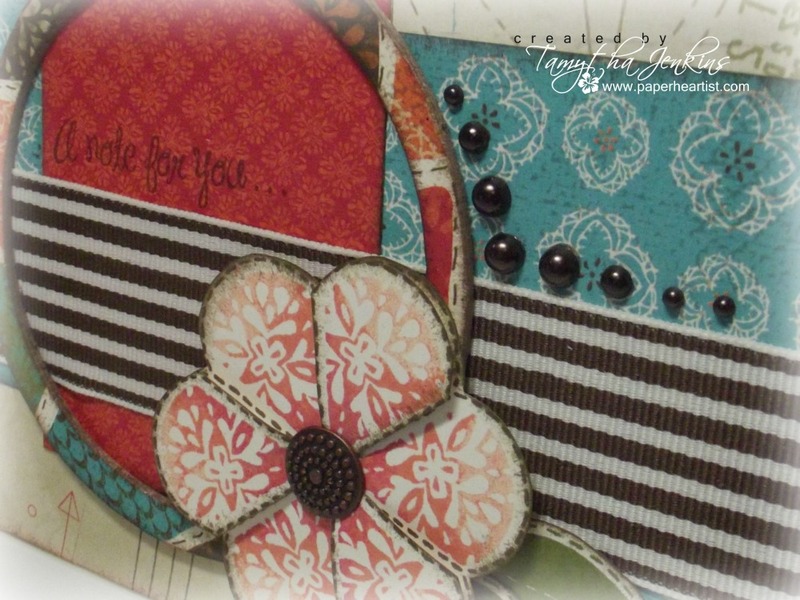 Beautiful card, I am a follower an also a member on Let's Scrap. This is absolutely, positive, without a doubt the best interpretation *ever* of this card sketch! Fantastic job, Tamytha! I am already a member of Let's Scrap and have been a follower of you blog for a short time now. Love the ruler!! Ditto what Kay Wallace said...I'm speechless! I super love your interpretation of the card! The colors are beyond gorgeous & your use of the grosgrain ribbon is to die! See you on Let's Scrap...glad to be following! Hi Tamytha! I love the card and it is great how well you listed supplies and directions! You make beautiful sound easy! Thank you so much for hosting the Let's Scrap Blog Hop. Your card is amazing I love how you extended the ribbon over the edges, the big flower you used and all the bling. I love CTMH products but don't think I have ever seen the ruler before. Looks like a really handy tool. I am a follower and of course am a member of Let's Scap. So excited that the blog has finally started, being in Australia, I am like 15 hours ahead of you girls and have been waiting an extra day.. now I wake up this morning bright and early and can FINALLY start playing with.. yipeee... thank you for all the hard work.. you girls are doing a great job ! I just love your example card.. it just jumped out of the LS gallery at me.. amazing work.. well done.. and Debby has been doing a great job on the card sketches.. wow, how busy is she !!! Have been a member of Let's Scrap forever and am a member of your blog (which is awesome) ! (lol) AND will be making a card soon and will post link here. I'm a new follower of yours, and been a member of LS for a while already. Love your card and the way the ribbon exends over the edge. Your RAK is also amazing - never seen that before, so going to have to make a card here for a second chance to win it! Your card is beautiful. I am a new follower and joined Let's Scrap. Gorgeous card! I've been a member of LS, and I've joined your blog =) Thanks for being a fellow host...this will be such a fun hop! Love your card! Inspires me to get cracking on making cards. I'm a member on LS and now your blog. New at this blogging thing and I must admit I'm loving it! I love what you have done with that sketch - esp the flower. Great stamping. Thank you for the great blog hop. I am now a follower and have been a member of LS for a long time. Hi Tamytha! It is so nice to meet you here on the blog hop! I am a fellow host and am loving meeting everyone today as I hop backwards!!!!! Your blog is amazing and I just became a follower a couple of days ago. I love your take on the sketch - thanks for the great instructions!!!!! Hello, I absolutly LOVE your card. It has so much detail. I am a member of LS and now a follower of your great blog. I love your card. Am a follower of LS and your blog. 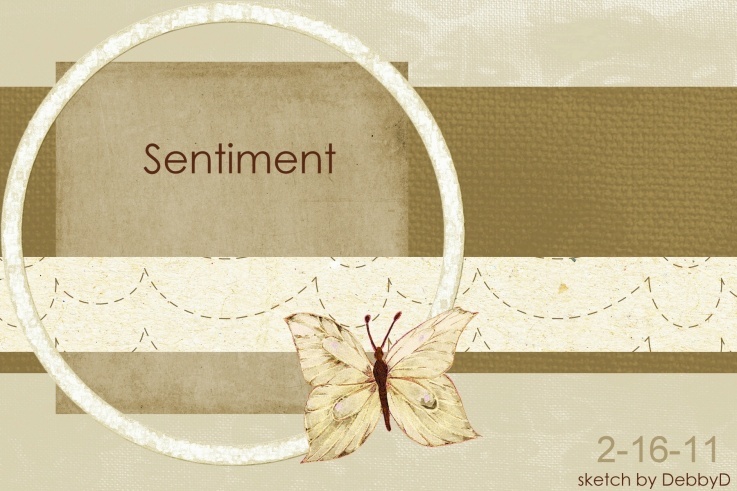 I love the colour palette for your card, and your interpretation of the sketch is really creative! Thanks for sharing! I have just become your newest follower! Just letting you know I have added my card to the LS Gallery - http://letsscrap.ning.com/photo/spread-your-wings-leap33?context=user. Thank you for the great hop. I love the texture and the ribbon off the edges! Awesome!!!! I am a new follower and a LS member. Love your card, it's beautiful. I am a follower and a member of LS. Hello! Your card is awesome! I am a follower and member of LS. I just joined your blog so I am looking forward to see new projects! Thank you for hosting! Love, love, love your beautiful card!!! Great work with the sketch, and love your RAK too, that ruler rocks! What a beautiful card, and it is a great idea to provide instructions! I am already a follower of your blog. Hi, Tamytha! Your card is absolutely gorgeous...already left you some love in the LS gallery! Thanks so much for being a stop on the card hop! I am a long-time LS member, and I have become a follower of your blog. I'll be back with my card for the second chance! Hi I am back for a second chance to win your lovely giveaway. Here's the link to my card in the gallery. Hi from Virginia! I am a member of LS & a new follower of yours! Looking forward to seeing your many creations. I like your card. The cut out circle is very inspiring. thanks for helping host the leap.. great job. I can tell from all of the beautiful detail on your card that you put a lot of effort into it! I'm sure whoever receives it will appreciate that! I am a member of LS and now of your lovely blog (at least I HOPE I did it right!). Good morning from Canada's chilly east coast. I am a follower of your blog and a DT member at Let's Scrap. Thanks for being a fellow blog host, I am number 50 in the hop. Love your card sample, it is so pretty. Hopping over to LS to post my take on your host sketch to the gallery. I used your card sketch for a baby card. I like your card way better than mine but mine is okay. will post at Let's scrap gallery but for now you can see it on my blog. Hi Tamytha...Already a member at LS and have just joined your amazing blog...so much inspiration...will certainly be back for more. Your card is absolutely stunning and luv the sketch. Thanks for sharing. What a gorgeous card! I follow and am a member and host 47! Wow! Your card is so gorgeous! I love it! I am a long time follower of LS and I am now following you too! I am now a follower and already a LS member. Love your card... so effective with the ribbon hanging over the ends. Tamytha, love your card and the instructions you provide are so slear and easy to follow. I am now a ollower of your blog and I have been a member of LS for sometime now. hi Tamytha, i have changed this tag and it keeps coming up LEAP 35 but I have tagged it LEAP33 in my album. At first I skipped your sketch, but then I took the challenge because I like it and I love the way you made your card. It inspired me for my card. I am going to post it as soon as I uploaded it. Just joined as a follower (no 158) and thanks for hosting this bloghop which is lots of fun to me. I am back with my link. 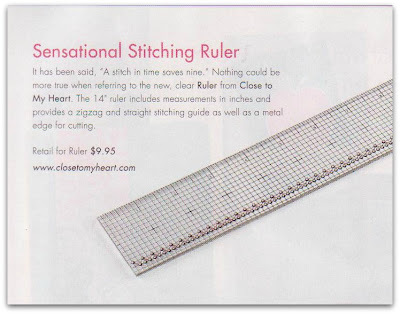 I haven't seen a stiching ruler in reality but heard about it in online groups. I am really curious how this works. Hi Tamytha, I am now a follower to your blog. Your card is gorgeous. Thanks for hosting. 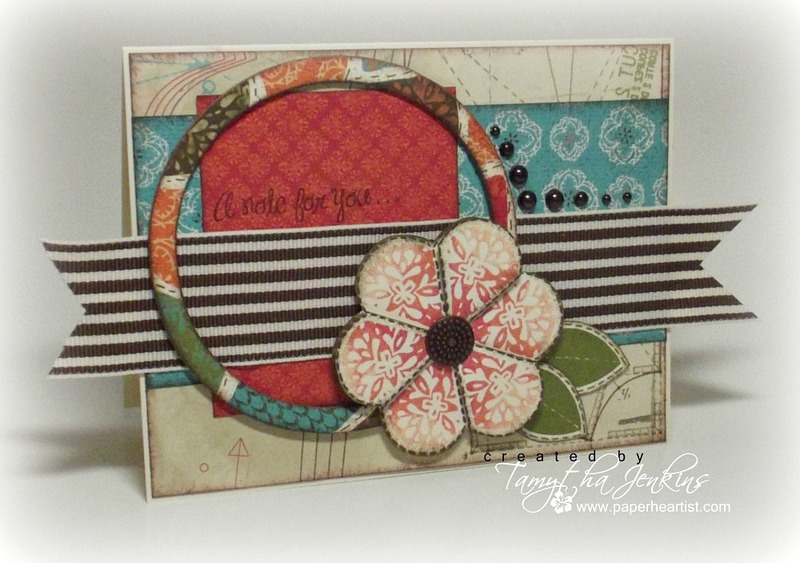 Hi Tamytha, Back again with a link to my card on Let's Scrap. LOVE your card Tamytha! It will definitely make someone's day. I am a member of LS and a new follower of your blog. I’m a new kid on your blog and I’m a member of Let’s Scrap. Thank you for the chance to win the awesome Leap Candy you are offering! What a great example card and I LOVE your prize! I have read about it and from what I understand it is a MUST HAVE! suuuuuuuperb card. Loved the way it is. urs new follower and a member of LS. Hey, Tamytha...just hopping back to leave the link to my card for the second chance! Thanks again for hosting a stop on the hop!